Lattice3D Reporter brings the intuitive power of 3D visualization to anyone by enabling consumption of interactive 3D models and associated information to anyone using either Microsoft Excel spreadsheets or interactive 3D PDFs. 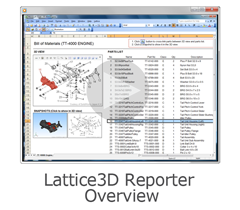 There are two sides of Lattice3D Reporter: Author and Consume. By using the free "add-in" for Microsoft Excel, anyone in your extended enterprise can have access to the product data they need to perform their job. With Lattice3D Reporter, you can easily and quickly embed ultra-lightweight versions of your 3D CAD models into any Microsoft Excel file. The model and its parts are linked to BOMs, assembly instructions, procurement lists, etc. 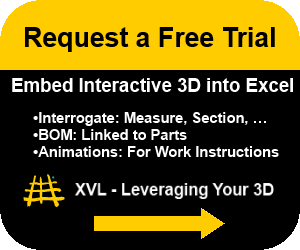 Lattice3D Reporter immediately and easily improves accuracy, communication and product time-to-market.Use Excel spreadsheets for leverage of 3D CAD models across the Extended Manufacturing Enterprise. Lattice3D Reporter with the Template Option delivers unprecedented automation advantages into spreadsheets at a single click of a button. 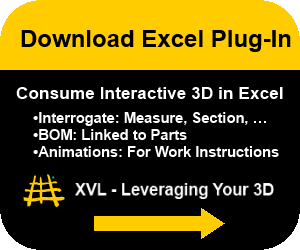 By using pre-defined templates, you can create print-ready and digital reports, parts lists, work instructions and more directly from XVL or 3D CAD data into an Excel spreadsheet — with almost no human interaction required. Because this feature fits directly into a workflow, all stakeholders in a product manufacturing process have the right information as soon as it is released or updated by the design departments. Click here to view a brief demo. Raise the level of communication throughout your organization. Capitalize on the intuitive power of visualization for communication of accurate work instructions, detailed parts lists and mBOMS/sBOMs. Integrated and animated 3D processes allow parts to be visually cross-checked on the documents. Deliver accurate work instructions and reports as soon as design data is released. Downstream users can immediately prepare, train and operate with the right documents and data. Build 3D spreadsheets into existing processes and IT infrastructures using industry-standard document formats with both print-ready and digital versions. Always have the correct data on hand, even when changes have occurred upstream. No more waiting weeks and months for new instructions and reports. Expands the Microsoft Excel toolset for 3D – Lattice3D Reporter works inside Microsoft Excel and saves your reports in the ubiquitous spreadsheet format of Excel with the standard “.xls” extension. The document includes all the XVL data and works on any Excel application. Lightweight Format – All 3D graphics load quickly from the lightweight XVL format. This capability allows you to locate a part on a list visually, rather than trying to remember long numeric IDs. The embedded viewer also includes smaller thumbnail options or “snapshots” with each part entry, allowing you to include alternate perspectives, assembly relationships, or animated instructions. Automated update – When your engineering data is updated and released, Lattice3D Reporter can use the new data to automatically update the previously created spreadsheets. .